Custom fabricated aluminum backer louvered panels with chasing neon disc segments. 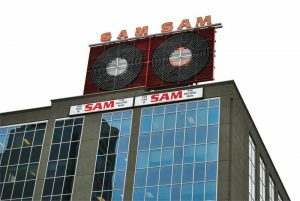 The original SAM letters were refurbished and rewired with light-emitting diode (LED) bulbs and LED flex outline. The letters were spaced to match the original letter spacing. The centre spindles and clear red neon script were salvaged from the original signs. Originally comprising two signs that were installed more than 15 years apart by two different sign companies, the signs were not completely identical and these inconsistencies were maintained in the refurbishment. 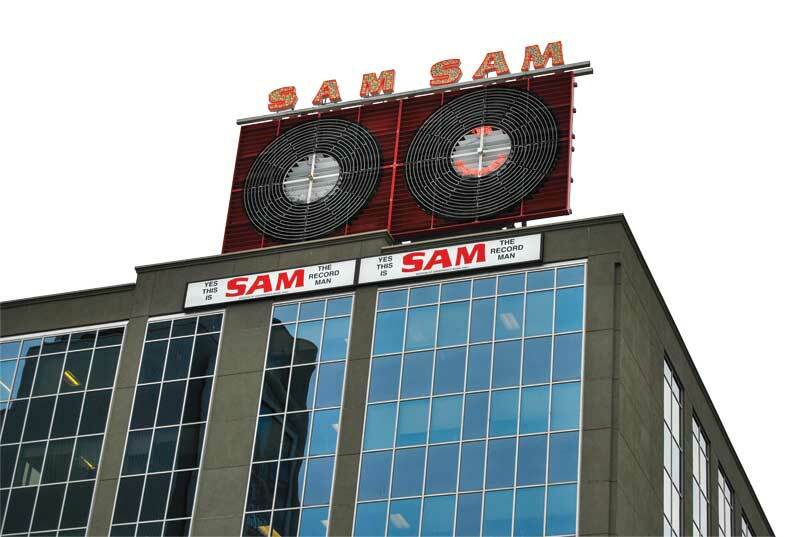 The discs were converted from solid background wall mount signs to rooftop-mounted signs with a louvered background to allow wind to pass through.